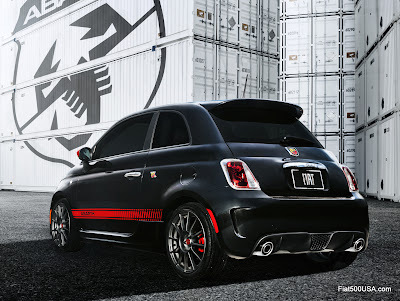 Fiat released a couple of teaser pics of the new US Fiat 500 Abarth plus some back ground on the Abarth company. The 500 Abarth will be unveiled on November 16th, at the Los Angeles Auto Show. The images show a car that is nearly identical to the European 500 Abarth save the obligatory US spec side marker lights. The car shown has what appears to be the 17x7 OZ Racing wheels from the high performance 'esseesse' kit available as an option in Europe. Not much is known about the specifications of the US 500 Abarth. Insiders have eluded to the car having ALOT of performance and even eclipsing the European version. How much horsepower the car has is a tightly guarded secret. 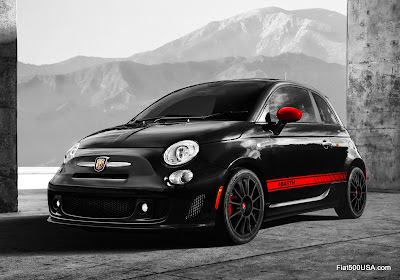 Estimates range from the European 500 Abarth's 135 HP to reports as high 200 HP. Certainly the 1.4 L MultiAir Turbocharged engine is capable of this. Back in January 2010, Chrysler released preliminary specifications for the 1.4 L MultiAir Turbo showing 170 HP. We speculated here on this blog that indeed the car could very well have this horsepower specification either as a standard figure or as an optional package like the 'esseesse' kit sold in Europe. The popular 'esseesse' kit boosts the performance of the European 500 Abarth by bringing the stock horsepower up from 135 to 160 by means of a recalibrated ECU. Also included are a set of springs that lower the ride height an additional 5mm, performance brakepads, drilled rotors all the way around, free flow air filter and the above mentioned 17inch OZ Racing wheels mounting high performance rubber. Rounding out the package are discrete esseesse badging. The 1.4L MultiAir Turbo will be rated at 170hp, that's up from the standard European spec'd version with 135hp and even up from the optional Esseesse version with 160hp. That power output, 2.04hp/cu in (124 hp/litre), puts the 1.4L MultiAir Turbo engine as having one of the highest specific power values in the world! In addition to the upgraded power plant, the Abarth will also sport unique exterior features including a full body kit, wider fenders, and Abarth badging. Due to its early 2012 arrival, the Abarth model is expected to wear a 2013 model designation. The fuel door is on the driver side now? I would hope that the wheels are simply an option as pointed out in the previous post regarding the Abarth spotted in Michigan. Having to shell out an extra $2,000 or more for a kit to make it competitive with a Mini Cooper S would make it much less desirable unless the base price was only slightly more than the 500 Sport. Paying 20k for a car with only 135 ponys puts it at a pretty distinct disadvantage to cars like the Mazda 2, Honda Fit, and especially the new Chevy Sonic. Here's to it having the specified 170 HP at launch! I fail to see how that puts it at a disadvantage. If the only changes made to the power plant to put down an extra 35hp is an ECU program (factory mind you) then the after market will make a better one within 6 months of release with an average cost of ~600 dollars. How is that a disadvantage? You then have a car that is less than 3000 lbs at the curb with nearly 200 hp. Brilliant!